Various wearers found the sizing to be accurate. The midsole provided sufficient cushioning and underfoot support, according to a runner. The shoe performed great in all-day runs, as well as walking and some light exercises, as experienced by a user. A runner claimed that the shoe offered a secure fit that was not too cramped. Many reviewers found the shoe to be lightweight, and some were happy that it did not weigh the foot down while running. The heel area was very supportive, which was perfect for heel-strikers, said a tester. The mesh upper felt nice on the foot while running in warm weather, a user remarked. Several runners found the outsole to be firm yet flexible. A lot of buyers were happy that the neutral colorways available were easy to pair with outfits. One customer stated that the shoe was stiff at first and needed a break-in period. The Flytefoam® midsole seemed lacking in bounce and liveliness, a reviewer wrote. The Gel Cumulus series has remained a runner favorite, based on the positive reviews the 20th iteration has received. The various structural elements of the shoe have proven their efficiency, while the features have stayed functional. Very few negative opinions surrounded the shoe’s design, and with this, the Gel Cumulus 20 has proven its unwavering reliability. The version, and it continues to impress me. The upper is different from the old Gel Cumulus 19 uses a new jacquard mesh material for breathable coverage. It has enough perforations to allow air to pass through efficiently, keeping the foot well-ventilated throughout the run. It also offers glove-like fit for comfort. The FlyteFoam Propel technology is also placed in the midsole. It offers runners a comfortable, responsive underfoot cushioning. It is lightweight and durable for long-lasting performance. The outsole has a new tread pattern for enhanced traction, and the Guidance Trusstic System has been removed for a smoother transition. Jacquard mesh – This material offers a breathable coverage and customized fit. It is durable, lightweight and comes in a seamless upper design. Personal Heel Fit – For a more personalized fit, the shoe has two-layer memory foam in the heel collar. Discrete Eyelets – The eyelets were designed to reduce tension when the shoelaces are tightened. The independent holes enhance the overall fit and comfort of the shoe. Reflective details – Reflective details on the heel area offer added visibility during low-light condition. FlyteFoam – A notable midsole technology, which offers lightweight and durable cushioning throughout the run. The midsole foam delivers a responsive and springy ride. Flytefoam Propel – Another layer of midsole cushioning which offers added responsiveness and underfoot comfort. Impact Guidance System (I.G.S) Technology – It aims to deliver adaptive and dynamic stability. It aids the foot for a more balanced, smoother heel-to-toe transition. Gel cushioning – Offers better shock absorption for enhanced running performance. It is specifically placed in the forefoot and rearfoot for better a smoother transition. Asics High Abrasion Rubber (AHAR) – A durable rubber material that gives protection to high-wear areas. It gives added traction without affecting responsiveness and flexibility. DuraSponge Rubber – A blown rubber compound placed in the forefoot which gives added flexibility and cushioning. The performance of the Asics Gel Cumulus 20 on the road is truly impressive. I have been an Asics fan for a few years, and this neutral running shoe did not disappoint. I like the lightweight construction as well as the responsive cushioning. It feels so light and fast on my feet. I always admire the FlyteFoam midsole and Gel cushioning. These materials made my running experience more responsive and well-protected. The shoe is strikingly responsive and flexible. The outer sole of the shoe is very durable as well, thanks to the AHAR and DuraSponge rubber. They provide reliable traction on the road. The grooves in the outsole also offer added flexibility, making every stride even more satisfying. Overall, I am truly happy with this road running shoe. Just like my other Asics running shoes, the Cumulus 20 is true to size. I love the roomy toe-box. It gives my toes more freedom to move freely. The forefoot is not tight as well. I am a medium-footer runner, and the shoe fits like a glove on my fit. I had one issue though. At first, the heel area felt too tight; maybe because of the memory foam added in the heel collar. It was a small issue, and it did not stop me from wearing this shoe. Thankfully, after wearing the shoe more than ten times, the tight heel fit started to loosen, and now, it fits perfectly – no heel pressure, no discomfort. The shoe is breathable and comfortable enough for long-distance runs and long-hour wear. I love the seamless design and the jacquard mesh upper that wraps my foot like a glove. The mesh is stretchable, and it notably conforms to the shape of my foot. Also, the cushioning offers comfortable underfoot protection without affecting ground contact. I highly recommend the Asics Gel Cumulus 20 because of its impressive performance and affordable price. The cushioning, durable outsole and an impressive fit really deserve a special mention. Overall, this lightweight running shoe is indeed a wonderful update. The Gel Cumulus model has been the favorite of many for 20 years now. It is one of the Asics well-received road running shoes, and it continues to wow several Asics fans. Now on its 20th iteration, the shoe features an updated design and premium technologies for better performance. Aside from its impressive ride quality, the shoe also has a good-looking design, making it suitable for casual days. version of the Gel Cumulus offers a redefined design to enhance the running experience of every runner further. It aims to provide a comfortable, smooth, flexible, and responsive performance on the road. The major update of this model can be seen in its midsole. Asics uses its new midsole foam – the FlyteFoam Propel. This technology further enhances the performance of the FluidRide and FlyteFoam cushioning. It gives an additional layer of foam for enhanced comfort and responsiveness. Designed for long-distance road running and quick-paced training, the men’s version of the Cumulus 20 weighs 285 grams while the women’s version weighs 236 grams. It has a heel drop of 10mm and is available in both medium and wide widths. The upper of the Asics Gel Cumulus 20 is made of a jacquard mesh material which offers maximum breathability and comfort. Strikingly, it keeps my foot cool and dry even after a long run. Since it has a seamless design, the upper mesh wraps the foot comfortably while also reducing the possibilities of hot spots and blisters. The overall comfort and breathability of the shoe is remarkable. It is comparable to the New Balance Fresh Foam Zante v4 which also employs a jacquard mesh with no-sew design in its upper. I have read some reviews about the old Asics Gel Cumulus 19. Several users mentioned that the midsole of the 19th version was not responsive as expected. It feels lightweight but not bouncy. Thankfully, I did not experience it with the Gel Cumulus 20. The cushioning of the shoe offers a good amount of bounce, and it is very comfortable. I think the improvement in the shoe’s performance is due to the FlyteFoam Propel, a lightweight cushioning that gives added bounce and softer feel. When it comes to the overall grip, the outsole offers an impressive level of traction for road running and even in light and even trail surfaces. It is made possible by the AHAR and DuraSponge rubber materials which also deliver added durability and flexibility. The Asics Gel Cumulus 20 runs half-a-size small, and they have a very tight fitting. It is not manageable even with thin socks. There’s a lot of pressure on the forefoot and heel. The toe box is not roomy at all. To get the right fit, one must pick a larger size. Users should try the shoe first before purchasing a pair. The Cumulus 20 is impressively durable – from the upper to the outer sole. Most of my Asics running shoes are durable, and I’m happy that this pair did not disappoint me. I have worn the pair for several miles already, and it still looks like new – no significant wear even after using them on light trails. I love the overall design and enhancements made to the Cumulus 20. They look fashionable, and they are responsive and lightweight at the same time. The shoe is ideal for long-distance runs and daily training. Though they feel tight, I would still recommend this shoe for runners who are looking for an affordable yet well-performing road shoe. Asics Gel Cumulus 20 – The all new Flytefoam version of Asics’ classic shoe? This is the 20th edition of Asics long-running medium mileage shoe. I don’t have any experience of earlier versions of the Cumulus so am coming out at them with an open mind. Thank you to Asics for sending me them to try so here goes. The Cumulus 20 look a bit like the Gel Kayanos that I have in the same colour scheme. The most striking thing about the design is the sole which looks very slim with less padding than there really is. It is cleverly done so the Cumulus does not look too chunky as the upper and sole blend together well. The upper fits with the current trend of using a stretchy mesh that opens up when you put your feet in giving excellent breathability. This makes them super comfortable, almost like wearing a thick sock, but makes me wonder about durability and how suitable they would be for running in bad weather. I haven’t run in the rain yet and am not sure I will. On the plus side, I went out in them straight out of the box with no rubbing at all. The toe box did feel a little narrow so not sure how good they would be for those with wider feet. Compared to the Kayano, the Cumulus is noticeably lighter but there is markedly less cushioning. For me, these are a low to mid mileage shoe and I would not want to go further than half marathon distance. The Cumulus uses Ascis’ Flytefoam midsole which is lighter but firmer than traditional midsoles. I could definitely feel the reduced cushioning in the forefoot but this did mean a more responsive ride. There is a compromise here, padding versus feel, so if feeling the ground beneath your feet is a priority then the Cumulus could be for you. If it is a soft, plush ride you are after you should try the Kayano 25 instead. As with all Asics shoes I have tried, the ankle cuff is beautifully padded to give a cosseted feel that gripped well but without being restrictive. The tongue is soft without making it hard to tie the laces securely. The heel cup is stiff enough to hold the back of my foot in place without being noticeable. There was no slipping and my foot felt really secure. I am a UK 10.5 in pretty all running shoes and the fit here was consistent with that. The tread pattern looks fairly minimal but provides plenty of grip where needed. For me, they are not for really wet days or trails but otherwise, the tread works well. I have not run far enough to confirm this but the tread looks durable with tougher rubber in the parts most likely to wear out. The Cumulus is a well-made, luxurious feeling shoe for short to mid-length runs at a steady to fast pace. There is plenty of feeling underfoot due to the moderate cushioning and the stiff sole. The lack of flexibility is noticeable and may be an issue if you are used to something more supple. The Cumulus is also very much a neutral shoe with no under-arch support. Mild overpronators could manage with these shoes but anyone looking for some support should look elsewhere. Overall, the Cumulus feels fast and comfortable, with a large sole surface area giving good shock absorption. Personally, I would appreciate a bit more stability over longer distances but as your feet tend to sit quite low in the shoes I did not feel as though my feet would roll over beneath me. I really like the Cumulus styling and they are a lot lighter than other Asics distance shoes I have tried. They are fantastically well made and look like they are built to last through many runs in the future. However, they are not really the soft, cushioned long distance shoe they are marketed as. Long distance or heavier runners looking for a plush ride may not enjoy the firm and stiff Flytefoam midsole due to the lack of cushioning. But for something a bit faster on a mild spring day for many miles to come they could be ideal. The ASICS Gel-Cumulus 20 is a solid, daily shoe that’ll go on and on, supporting and cushioning every stride as you churn out the miles. Whilst remaining a neutral shoe, the Gel-Cumulus 20 provides plenty of security. The stiff, extensive heel cup holds the foot firmly yet comfortably, and there is additional arch support provided by the sock liner. A combination of foam and gel technologies in the midsole offer good shock absorption and cushioning although this does come at the expense of responsiveness. It had been a very long time since I’d worn an ASICS road shoe, and so when I had the opportunity to test the Gel-Cumulus 20, I was very keen to see how it compared to the New Balance and Brooks road shoes I’ve used primarily in recent years. 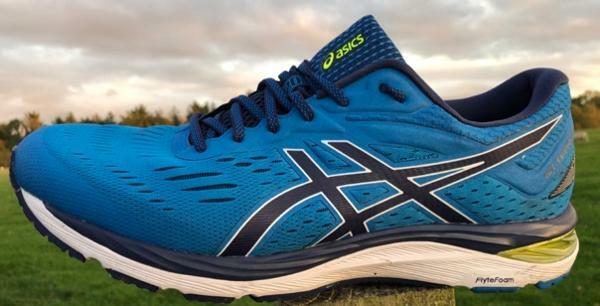 The Gel-Cumulus 20 looks and feels like a solid, well-built shoe. Initial impression is that it is of similar build quality to the New Balance 1080v8 or the Brooks Ghost 11. When I lift it from the box, however, the upper feels far stiffer and more supportive than either of these other shoes, in particular, the extensive heel cup which is high, solid and extends a long way forward, almost in line with the laces. There also seems to be much more arch support though a little investigation reveals that this is in large part due to the sock-liner which extends up into the arch. The shoe comes in a range of colours. Men’s shoes are primarily in blues and greys though there is a bright red for anyone wishing to make a statement. The ladies shoes have largely similar base colours but are generally highlighted with brighter colours, as well as a Mojave / Fuschia Purple. My shoe pictured here is the Race Blue / Peacoat. The Gel-Cumulus 20 is listed at 285g (10oz) which means that it is not a light shoe, but it is pretty well where you’d expect the weight to be for an everyday shoe with the level of cushioning provided. It also weighs in lighter than the Ghost 11 (309g) and the 1080v8 (314g). 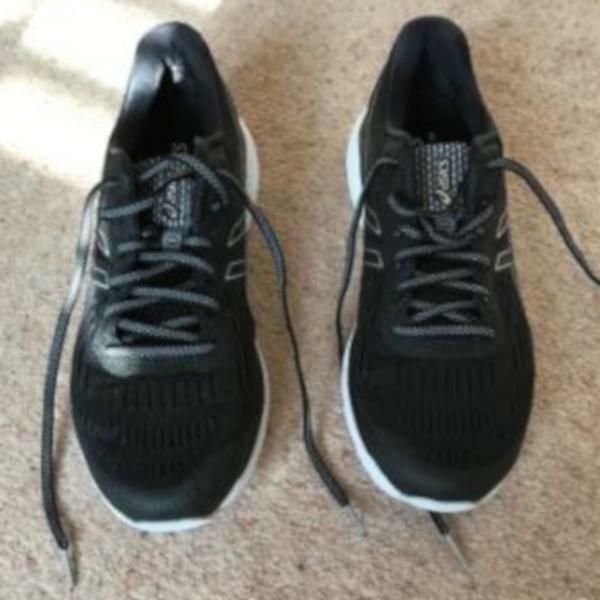 As expected, my UK 13 (US14) weighed in heavier than the standard shoe, at 360g, and whilst it obviously isn’t a light shoe, it did not feel significantly heavy when running. I have previously tended to wear ASICS “true to size” so that I’ll wear a UK 13 / US 14. This is the same as I’d wear in Brooks and Inov-8 compared to New Balance, Hoka, and Salomon Trail where I’d size up by ½ (UK). US readers please note that despite the variation in sizing across manufacturers, I almost always require a US 14 / EU 49. It’s quite possible that the differences in sizes, therefore, are due to conversions from US to UK sizing. The Gel-Cumulus 20 is a fairly snug fit. It is narrower than the road shoes I’d usually wear (more akin to an Inov-8 precision fit), throughout the length of the shoe, although there is more space in the toe box. ASICS do offer this shoe in a wide fitting which I’d recommend for any runner with feet even slightly wider than usual. Furthermore, if I had this shoe again, I would probably go up by ½ size to provide a little more room. I had expected the extensive, stiff heel cup to feel somewhat confining, but was pleasantly surprised to find that whilst the foot was held snugly, it was also comfortable throughout all of my runs and did not impinge on my running style or ankle movement at all. The construction of the upper is similar to many similar shoes across the industry; a double layer of engineered mesh, with fine holes and slits in the outer layer to allow movement and ensure that the shoe is breathable. Overlays are glued to the mesh in the shape of the ASICS logo to provide additional support to the midfoot, and also to form the lace eyelets. The placement of these overlays is effective, and when laced, the foot feels secure and well-held throughout. The “toe bumper” appears to be a simple reinforcement of the mesh around the front of the shoe, perhaps using a form of resin, which means that the toe is offered a degree of protection without sacrificing either flexibility or weight. The tongue is well-cushioned, simply stitched at the bottom, and held in place by a lace-loop in line with the third row of holes. The tongue is comfortable and held well by the flat laces. Once laced in, I’ve never felt the tongue move at all. The shoe does not appear to be exceptionally well cushioned around the ankle, especially when compared to a Ghost 11 or similar shoe, but nor does it need to be. The ankle and heel feel more than comfortable enough, and as mentioned above, there is no intrusion from the high, stiff hell cup; the shoe simply holds the foot in place comfortably. As someone who hasn’t worn ASICS road shoes for a while, this is the bit that took a little bit of getting my head around due to the different compounds used in the sole, and the company’s own description only added to the confusion with the Gel-Cumulus 20 “…featuring new FlyteFoam technology for optimal bounce back, new full-ground contact outsole for smoother heel-to-toe movement, and a new SpEVA Foam lasting that provides ample room in the ball girth and toe area… and GEL technology cushioning system ensure enduring comfort”. So, my understanding is that the upper is stitched to a Strobel board of Asics’ SpEVA foam (light blue, and visible below the sock-liner) which is glued to the layer of Flytefoam Propel (the dark blue layer seen on the images) which is softer, and gives greater energy return and propulsion in the toe-off than the standard Flytefoam (the white layer) on which it sits, and which provides the cushioning and stability. Sandwiched between these layers of Flytefoam below the outside of the heel is ASICS unique gel system which reduces the impact of the heel on landing. Above all of this sits a well-cushioned sock-liner which partially extends up into the arch of the foot to enhance support. Whether or not you followed all that, the most important question is, of course, how does it feel? Perhaps surprisingly, the variety of compounds and materials that make up the insole of the Cumulus 20 actually seem to work well together to provide a comfortable low-impact landing, smooth transition and decent toe-off. The Gel-cumulus 20 provides a 10mm heel drop comprised of a 23mm heel and 13mm forefoot (men's). The Gel-Cumulus 20 outsole employs Durasponge blown rubber sections surrounding ASICS’ vertical groove in the sole to “guide the foot through the gait cycle”, together with ASICS High Abrasion Rubber (AHAR) in the areas of high wear at the heel (light blue on this shoe). The Durasponge is lighter and more flexible than the AHAR. As the outsole is constructed in sections, with foam exposed in places, this should also deliver a more flexible shoe. In reality, the outsole cannot overcome the stiffness of the Flytefoam, and so the shoe doesn’t quite have the flexibility that the segmentation of the outsole suggests. At the time of writing, I’ve run around 50 miles or so in these shoes. I’ve mixed in a couple of longer runs together with some mid-paced training runs and a couple of shorter, faster sessions. So far, neither the upper nor the outsole of the shoes shows barely any sign of wear. Given the quality of construction of the shoe and the materials used, I would be very surprised if the shoes did not provide most runners with at least 500 miles of runners. Running shoes are highly personal, and so my experience and views of a shoe’s performance are based on my own experience and characteristics. I can’t speak for the front of pack runner but hope my views will be useful for both club runners and newer runners, as well as those on the heavier side (I’m around 85kg). The first few runs in this shoe were at a fairly steady pace; nice easy run, which if I’m honest didn’t do too much to tax either myself or the shoe. I’d recently come off the back of a few high mileage months culminating in a PB marathon attempt followed a few weeks later by my first ultra. The Gel-Cumulus 20 was perfect for this type of running. The confusing combination of foam and gel in the heel provided greater cushioning than I’ve felt in other shoes that I’ve used for this type of run e.g. Ghost 11, 1080v8. The gel seemed to absorb the impact of the heel strike in a way that makes it ideal for those recovery days when the legs need a little tlc. Unfortunately, the superior cushioning and absorption meant that there is very little energy return from the midsole, and I found it took more effort to increase the speed closer to marathon pace. I'm pretty well decided that the shoe should be resigned to those easy recovery runs, or long slow sessions, but wasn’t ready to write it off until I’d at least tried a couple of faster pieces. Once the legs had recovered a little, I pulled on the shoes for the first interval session of my new cycle of training – (10 x 500m with 500m easy recovery). I was really surprised to find the shoe to be very responsive in the intervals which were done at just faster than 5k pace. As I landed further forward on the foot, I found that the foot was well cushioned with each strike, but that at this faster pace, there was a fast transition and return of energy. I’ve found the same to be the case in subsequent interval sessions. So, this is almost two shoes in one. The heel-striker will find a well-cushioned trainer for long or steady recovery runs. Increase the pace and move the landing forward to the mid or forefoot and you’ll find a responsive shoe for faster intervals. I did, however, say that it is almost two shoes in one. Unfortunately, the weight of the shoe and lack of flexibility in the heavily built heel and midfoot make it unlikely to be the first choice for fast-paced training sessions or race-day. The Gel Cumulus v20 is a reliable all-around daily shoe. It’ll hold the foot well whilst allowing sufficient movement, and I’m confident that it is durable enough to outlast many other shoes. It’s a great choice for those easy paced days, or for running longer distances during which it will offer excellent cushioning with each strike. The responsiveness of the shoe at faster paces means that it could be a good choice as “one-size-fits-all” shoe for someone fairly new to running as it will be at home on a variety of surfaces including light trail. If you’re looking for that type of shoe, I’d also recommend considering the Brooks Ghost 11. Asics has released the 20th-anniversary version of the Gel Cumulus, and in this iteration, updates are presented through new materials that deliver an equally new fit-and-feel. While the shoe maintains a standard-weight structure and the familiar silhouette of the Gel Cumulus, this edition claims a more robust platform and a softer cushioning compared to previous releases. The upper displays a broader and higher toe box than the one in Gel Cumulus 19. The overall fit aims to be more snug and secure, as the heel cup and the ankle collar are now firmer. While the Gel Cumulus 20 retains the Discrete Eyelet™ in its lacing system, a new structure present is the reflective strip in the heel area. The midsole of the Gel Cumulus 20 has kept most of the technologies of the previous version. The only noticeable changes are the addition of a new cushioning compound and an updated sock liner. Meanwhile, the outsole brings back the DuraSponge® component which was included in the 18th iteration but not in the 19th. The Asics Gel Cumulus 20 features standard running shoe length, sizing, and weight. The shoe runs true-to-size, and accommodates wearers of all foot volumes, thanks to the width options of medium and wide for both the men’s and women’s versions. The Gel Cumulus 20 combines two distinct types of resources for its outsole – the Asics High Abrasion Rubber (AHAR®) and the DuraSponge®. Both materials work together to give the foot full ground contact and a stable ride. First, the AHAR® compound is found on the shoe’s critical, high-wear areas. Asics also used the material in the Kayano 25. With its abrasion-resistant quality, the shoe levels up on durability while maintaining the capacity for traction. It uses the same rubber that forms car tires; thus, runners are sure of its toughness. Next, the DuraSponge® rubber makes up the rest of the outsole. While it is also resistant to damage, this compound is made of blown rubber, making it a little bit softer than AHAR®. This permits the underfoot a comfortable ride and qualifies a flexible stride. The most notable update in the Gel Cumulus 20 is the utilization of FlyteFoam® technology in the midsole. This system aims to provide a consistent level of reaction, even for long distances. The Flytefoam® method uses unique organic fibers to form a cushioning that is 55% more lightweight than traditional midsoles. Aside from responsiveness, Flytefoam® also guarantees a flexible and resilient fit all throughout the run. These qualities help in making the Gel Cumulus 20 a durable shoe. The main midsole component of this neutral shoe is the FluidRide®, which is the combination of Solyte™ and SpEVA™, both cushioning compounds exclusive to the brand. FluidRide® is lightweight yet sturdy, and it helps improve running performance through its shock-absorbing and high-rebound properties. Like all other Gel shoes, the Gel® cushioning system makes its way into the forefoot and rearfoot areas of this shoe. The Gel® zones act as shock absorbers through the gait cycle. As smooth transitions are achieved, the foot is enabled movement in different planes. The Gel Cumulus 20 also employs the IGS®, short for the Impact Guidance System. IGS® is the term for the design of the shoe that aims for dynamic and adaptive stability. IGS® uses the Guidance Line® as a tool to help achieve the goal. With Guidance Line®, the center of pressure is adjusted, thus improving balance and gait efficiency. An OrthoLite® sock liner supplies additional cushioning and underfoot protection. It has an antimicrobial property that promotes a healthy foot environment. The stretchable Jacquard mesh upper gives the Gel Cumulus 20 a flexible, customized fit. Its elasticity is multidirectional, which brings freedom of movement. The mesh is reinforced in strategic areas to lend the shoe a supportive framework. With seamless construction, the shoe has fewer chances of causing skin irritation. A Discrete Eyelet™ feature is present in the lacing system of the shoe. These are independent holes that target a custom-fit and enhanced comfort, as they reduce the tension that is caused by tightened shoelaces going through a single eyelet. The upper, just like the GT 1000 7, also possesses a reflective strip in the heel area to allow prominence in low-light conditions.